So the Los Angeles Angels of Anaheim, if they're still called that, won the Shohei Ohtani sweepstakes and were able to sign him to a non-lucrative free agent contract, thanks to how international free agents under the age of 25 are handled in the current CBA. They also strengthened their infield defense, signing Zack Cosart and trading for Ian Kinsler. They re-signed outfielder Justin Upton, to pair with the best player in baseball. They have pushed their projections into a wild-card position, and have a very real chance of challenging the Astros for the AL West division. They have had a very good off-season. But what I'm interested in most about the Angels in 2018, is how they are going to handle Shohei Ohtani, the 2-way superstar, and his requests to both hit and pitch in the major leagues. 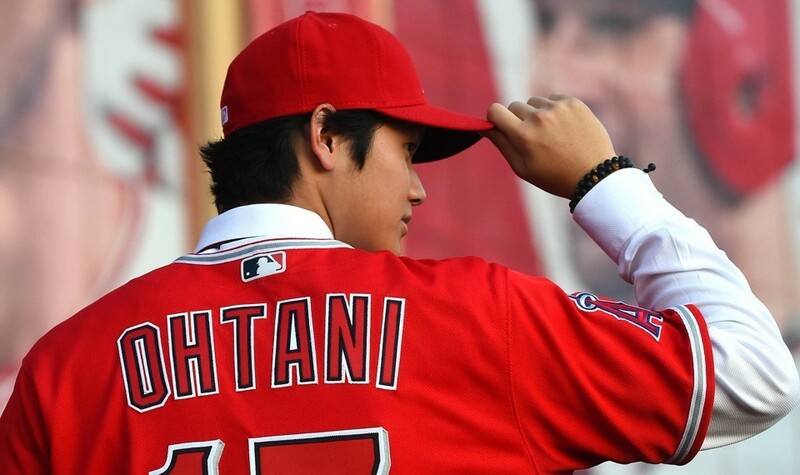 Ohtani could re-invent how baseball is viewed in terms of positional and roster flexibility. To understand what changes Shohei Ohtani can make on positional flexibility, lets first look to a rule change that was made one year ago, that being the switch from a 15-day disabled list to a 10 day DL. The rule was tweaked in the CBA in order to increase roster flexibility for teams, to avoid teams playing with shorter benches and to prevent players from playing through injuries. 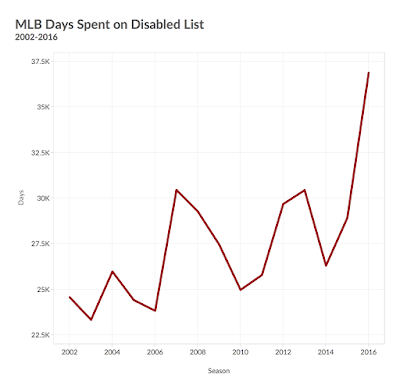 While in theory, this makes sense for both sides, what it has lead to is heavily increased trips to the DL, as well as more 'phantom' injuries. Teams were wisely able to manipulate their rotations in order to gain an additional bench piece, bullpen arm, or add a starter to the rotation mix. No team was able to manipulate the 10-day DL like the Los Angeles Dodgers, who had 38 separate trips to the 10-day DL in 2018. Of note, the Blue Jays were 2nd and the Mets were 3rd, but that seemed to be more a rash of bad-luck injuries than roster manipulation. 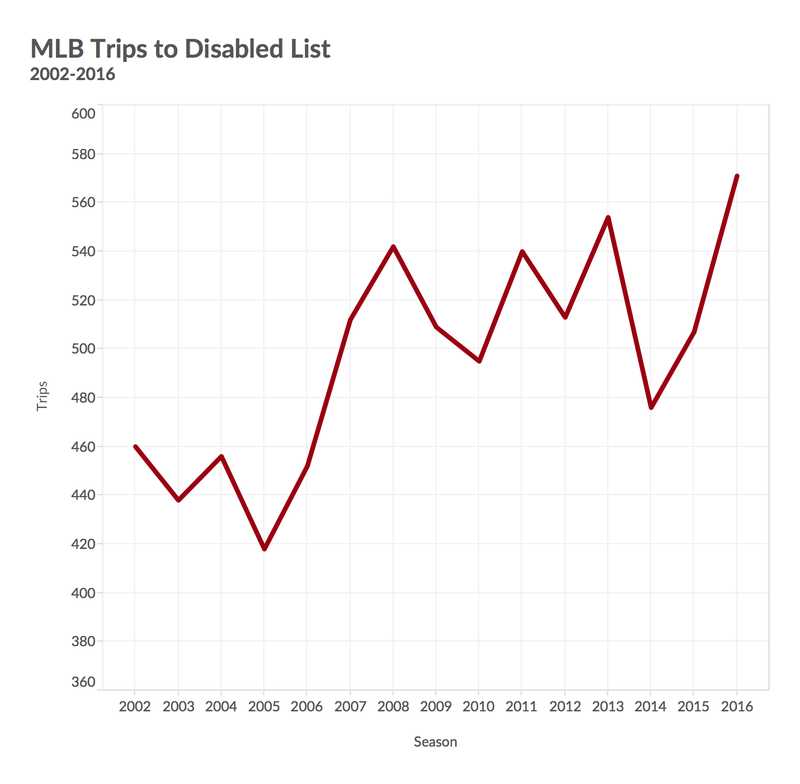 There were 659 trips to the DL in 2017, which shattered the 2016 high of 571 trips. 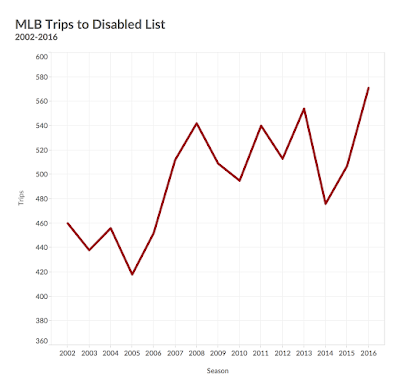 These two graphs, provided by RotoGraphs' Jeff Zimmerman from 2016 illustrate how the game has been shifting towards increased injuries or at least a shift of more trips to the DL. So of note, the Dodgers led all of MLB in DL stints in 2016 as well. I don't think this is a coincidence, as the Dodgers haven't run into much injury trouble with their core players outside of Clayton Kershaw, and his back troubles. This quote from Ross Stripling, on an MLB Statcast Podcast, really exemplifies what the Dodgers have been doing the past two years. "I’m not even really sure what I’m technically allowed to say," Stripling disclosed: "That was nothing but an inning limit. Nothing was hurt. They had to put me on the DL, and I guess a leg injury looks better than an arm injury." Kershaw actually led the team in starts in 2017, while missing over a month. They basically ran a rotation of Kershaw every 5th day, and then a 6 or 7 man rotation with the rest of their 'regular' rotation. 10 different pitchers started for LA last year. It's highly likely that the same amount of pitchers are used this year for them as well, and I wouldn't be surprised to see Kershaw take a 10-day stint or two to manage his innings throughout the season. Matt Shoemaker, (1.4 WAR, 120 IP). Now, on paper, that is a mighty fine looking rotation. The trouble is that between the group of them, I'm not sure they can put together a full ulnar collateral ligament. Ohtani and Richards are both diagnosed with partially torn UCL's, and have received PRP injections as treatment. Skaggs is returning from 2015 Tommy John surgery while missing most of 2017 to an oblique strain. Andrew Heaney had TJ in July of 2016, and Matt Shoemaker had a radial nerve issue that cost him most of 2017. 25.1, 27.2, 85, 77.2, 21.2. That's the total innings pitched by their projected starting 5 last year. Nobody had over 100 innings, so the projected innings listed above seem a bit unrealistic to me. Enter in guys like JC Ramirez, Parker Bridwell, and Nick Tropeano, and it makes sense that the Angels are probably in the best position possible to run out a true 6 man rotation. At first, I thought the Angels would throw Ohtani out every 7th day like he's used to in Japan, and DH him the 3 days in between his starts, with off-days mixed around the start. Simple enough, right? Then I realized Ohtani bats left, and Pujols bats right. There seems to be a way the Angels can manage the two of these guys interchangeably, and Travis Sawchik outlined the Angels need for a left-handed hitter. I think the Angels have the flexibility here with their rotation to have Ohtani basically only face right-handed pitching while taking the ball every 6th (or even 7th) day. I think, being a 23-year-old prospect, who has never played in the majors before I would be very careful overexposing him in his rookie year. I'd personally try to limit him to around 100 innings (he only threw 25 last year) and 250 at-bats. Especially when you factor in the UCL tear and leg injury he had in Japan. If any of you are in fantasy drafts, I'd probably stay away, especially if Yahoo! sticks to their original decision. He won't have enough innings or at-bats to be relevant. Back to roster flexibility, the way Ohtani is handled has the potential to be ground-breaking. Top talents from last years draft have emerged as '2-way' players, such as #2 overall pick Hunter Greene, or #4 overall Brendan McKay from the 2017 draft. Previously, players have been shoe-horned into choosing between the two generally before the draft or as they began their pro career. While nothing is more entertaining than a position player pitching as the bullpens dry thin (Ryan Goins anyone? ), or pinch-hitting your pitchers in high leverage at-bats late in games (thanks for the double, Stroman), the increase of players that are able to both pitch and handle the bat is great for the growth of the game. Players have tried their hands at both, but usually after failing at one, such as Rick Ankiel or Matt Bush. None have had the impact that Ohtani could have, according to some scouts. Having the ability to pinch-hit off the bench will be a huge gain to the Angels in high WPA moments. When reading about the Rule 5 draft, I noticed that one of the selections was former Blue Jay Anthony Gose. Now I'm sure most of you have heard that he is attempting a conversion from an outfielder to a pitcher. This wouldn't typically be very interesting, as I never put much stock into Gose being able to pitch successfully at the major league level. The Houston Astros, however, must see something in Gose that makes them think he could be a serviceable bullpen arm. He can touch 100 out of the pen and also has a decent second pitch, which would be all you need as a left-hander in a specialist bullpen role. This acquisition could be extra interesting if the Houston Astros, an organization known for being analytical and ahead of the curve, had any sorts of thoughts on using Gose in a 'duel-specialist' sort of role, that has never seen before in baseball. He could be a late-inning pinch-runner or defensive replacement while also serving as a LOOGY out of the pen. That would provide two useful types of players that contending teams are always searching for while only using one roster spot. Gose, in particular, is a guy who is described as toolsy, with his arm and speed being his two biggest tools. They could utilize both of his best tools without having to expose his weaker hit tool. The Angels, and potentially Astros, will essentially enter 2018 with a '26th' man, as they will have an extra bat available while carrying the regular amount of pitchers. The Dodgers, and I'm sure others, will take advantage of the 26th man by way of phantom DL trips. It's time the MLBPA and MLB add a 26th man to all rosters. A 26 man roster would conceivably be 13 pitchers and 13 hitters, and it would lighten the load on the pitching staff and further prevent injuries and fatigue. The 26th man would also help the 'roster crunch' of spring training, where guys with options are likely the first ones to AAA in position battles in camp. It will add a guaranteed MLB contract (and money) for the fringier, replacement level guys that float around teams. It also might help prevent the delaying of the 'Super 2' deadline, for some prospects where teams keep them in the minors for longer to gain an extra year of control. However, teams will likely continue to delay the clock of the uber-prospect types, like Robles and Acuna this year, and potentially Vlad and Bo in 2019. While we're on the topic of roster rule changes, let's limit the September call-ups to 5 per team. It's ridiculous that managers can have so many one-dimensional options available to them in the most meaningful month of the regular season. Roster flexibility has never been so important, and the added 26th man would benefit players, as well as major league clubs. If recent rule changes have indicated anything, the 26th man shouldn't be too far off in the MLB.